On May 30th my cousin, Sabih, graduated from college and yesterday we celebrated! 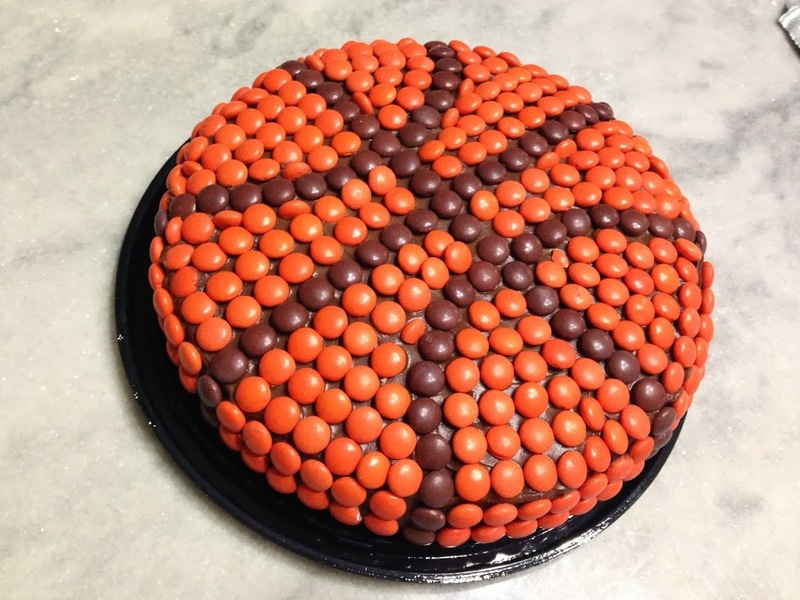 He loves basketball – and when I came across a similar idea a very long time ago, I had immediately thought at that time that I have to make this for Sabih! Fortunately, I remembered last week and decided to try it out this week. The no oil part in this cake? Love it! Preheat your oven to 350 degrees. Spray a [non-stick] 9-inch spring-form pan with non-stick cooking spray for extra precaution. In a mixing bowl, mix together your flour, baking powder, and salt. Next, cream your softened butter and sugar together until they are nicely incorporated together. Add in the eggs and vanilla extract and mix until completely combines. Combine your wet and dry ingredients together into one bowl. Add in the milk. Beat your mixture together until the batter is mixed together and smooth. Transfer into your baking pan. Bake for about 30 minutes, or until a toothpick in the center comes back clean. For the frosting? I used store-bought [milk] chocolate frosting today. From the [Oreo] Buttercream Frosting from this post back in April I learned my lesson the hard way: no more homemade frosting UNTIL I get a stand mixer. Why are they so darn expensive?! Would make my life so much easier! 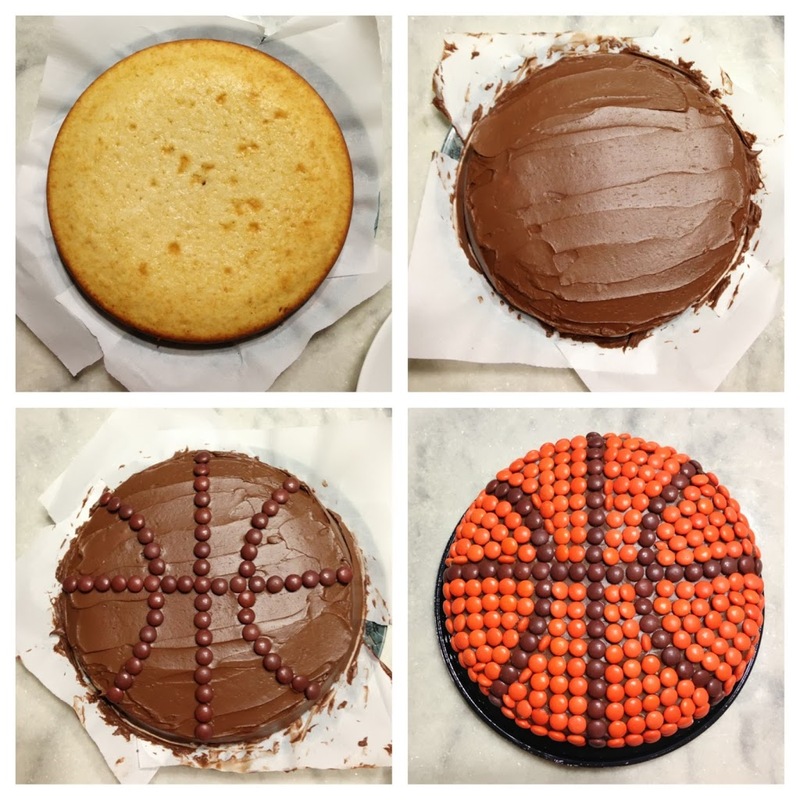 Tip: Make sure to let the cake cool completely before you attempt to frost. Makes a world of a difference, I’m telling you. After I frosted the cake, I separated the orange and brown candies from a bag of Reese’s Pieces to use to decorate the top of the cake. Using the brown candies, I first used them to draw a line straight down the middle. Turn the cake 90 degrees, and do the same. You should now have the cake divided in 4 sections and a visible “+” sign. Next, again using the brown candies, I drew two half circles on either end. Finally, fill in all of the areas where the frosting is still visible with the orange colored candies. Tip: I can’t emphasize enough how much laying pieces of parchment paper underneath makes a difference in the end result. I thought about doing this cake with M&Ms originally, but a) who wants to separate all the oranges and blacks from I don’t even know how many bags of M&Ms I would need b) I’ve already made a cake with M&Ms before and c) half the fun is experimenting!